This Saturday was the 2nd annual Teton Valley Great Snow Fest. This is predominantly a spectator event featuring that cherished winter pastime, the ultimate in chilly fun amongst steaming horse buns, skijoring. Last year, while my soul was cheered by the thundering hooves, the Olympian focus of the skiers, and the tribal whoops of the enthusiastic crowd, my fingers and toes ’bout froze to death. I hate having cold hands. It makes me cranky. But I also hate feeling like a landfill-oblivious citified wussy who cracks open a pair of disposable hand heaters the moment my mittened digits cross the threshold from December to March. Don’t get me wrong: products like the [easyazon-link asin=”B002O14BI0″ locale=”us”]Heat Factory hand and body warmers[/easyazon-link] are great if you need some extended-play external reinforcement for a blood flow that just isn’t up to the job. In fact, there are apparently even commercially available [easyazon-link asin=”B00A6O0QB8″ locale=”us”]reusable versions[/easyazon-link] that would at least alleviate the landfill guilt, but I only found out about those in the last five minutes, not two weeks ago when I made my own. I think I’ll call them “Sarah’s Mitten Steamer Buns,” in honor of a temporarily wounded ski-warrier friend who reminded me that warm rice in a sock makes a great impromptu heat pack. That, plus the photo above is the only one taken for this post that didn’t pose an eerie resemblance to a neat offering of steaming horse pucky. This would not be an issue, I imagine, if you chose a different color sock. Visual aesthetics aside, if you put them into the microwave on high for about 30 seconds each, and then place each HOT lump into your mitten or gloves, they’ll steam like specialty spa treats for the duration of a 45-minute walk and keep your fingies all warm and happy and smelling like lovely toasted brown rice, unless you want to mix a tablespoon of dried lavender into the rice and massage a generous dollop of good moisturizing cream into your hands before heading out, in which case your hands will emerge like you’ve just spent $30 on a high-end manicure. Take a pair of clean “thicker” hose (I used old “trouser sock” knee-high thingies that will never grace these liberated calves and tootsies again) and cut into 7-inch tubes. (Note to anyone not familiar with the term “knee-highs”: it’s important to use a fabric half-way between [easyazon-link asin=”B003CMYT8W” locale=”us”]Carhartt men’s extremes cold weather boot socks[/easyazon-link] and a woman’s 10 denier * [easyazon-link asin=”B008GPUNTE” locale=”us”]summer pantyhose[/easyazon-link]. Something thick enough not to succumb in total lameness to the pressure of a grain of rice , yet thin enough to permit a decently small knot diameter. Tie a knot in one end as close to the end of the fabric as you can, making sure that it is a completely sealed egress for wayward grains bent on going AWOL. Cut off any excess fabric from the end of the knot. Put 1/4 c. of brown rice into the sealed end of the tube, adding the lavender mentioned above if you care about such things. Tie a knot in the other end. 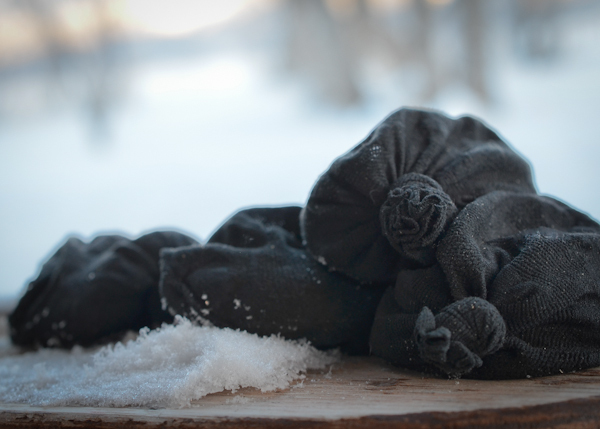 Congratulate yourself on being so handy, toss your new wee homemade reusable hand warmers into the microwave for 30 seconds each, pop them into your mittens, moisturize, and then get out and enjoy the snow! * According to Wikipedia: “Denier (pron. : /ˈdɛnjər/) or den is a unit of measure for the linear mass density of fibers. It is defined as the mass in grams per 9,000 meters. The denier is based on a natural standard—i.e., a single strand of silk is approximately one denier. A 9,000-meter strand of silk weighs about one gram.” And now you know why 10 denier pantyhose run merely by rubbing up against legs sporting a two-day old shave. Though ya Gotta love a steaming horse pucky! 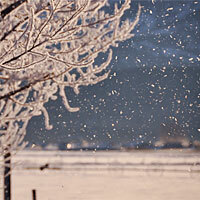 Terrific snow tree picture – lacy and delicate in such harsh conditions. Downunder we are battling the heat and I had to laugh on reading about your stocking hand warmers when here I am getting an odd sock out to tuck a frozen drink bottle into to place beside my poor pooch, whom after the 7am walk was prone on the tiles, on the kitchen floor, looking like he would expire at any minute. Once he worked out that this strange object was actually cool and refreshing, he dragged it into the studio to his bean bag and snuggled up to recover. The drink bottle is back in the freezer ready for the next walk. Love the picture of the tree in the snow….I could feel the chill, and almost imagine seeing my breath in the slight wind…yet..want to stare out like watching a fire burn! LOL!